During winter a lot of homeowners discover, much to their grief, that their house's air conditioning system fails to properly heat their property. 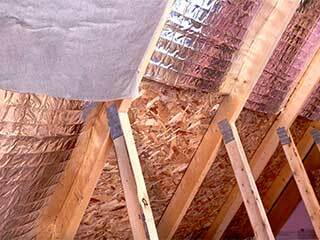 While sometimes the problem is indeed in the air conditioning system itself, at other times the problem is related to the intactness of their attic's insulation. That's why at Attic Cleaning Simi Valley we offer radiant barrier installation services for both homes and businesses in the area. Radiant barrier is exactly the thing that will allow the air conditioning system at your house to heat or cool the desired spaces properly. It may come as a surprise to some, but there are a lot of people out there who are not sure about the purpose of these means, how they work, and how they contribute to you and your house. When sunrays hit the building’s roof and upper walls, they emit heat. This heat usually moves through the roof and into your house, making it warmer in summer and a whole lot more difficult to cool. When you have a radiant barrier installed in your attic, you do yourself a favor. Remember those sunrays we talked about earlier? Well, these new means of protection actually deflect most of the heat back towards the roof and out of the house and emit very little of it down into the house. Moreover, when your house is warm in winter and the outside surroundings are very cold, the same insulation means will prevent heat from escaping out. If this sounds interesting and you'd like to have this great yet simple invention installed in your house to enjoy better temperature control and lesser electricity expenditures all you have to do is give our experts a call, kick back, and relax! Make sure you reduce heat transfer in your house with our comprehensive radiant barrier services!